Richard had been reading a blog post when he first learned that a fraternity brother named Chris was in dire need of a kidney. Knowing nothing about living donation and having never met Chris, Richard took the first steps toward seeing if he was a match and, ultimately, saving Chris’s life. 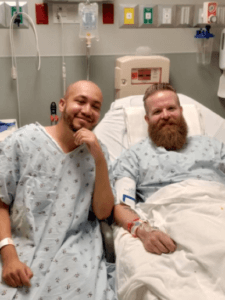 Richard was 32 and residing in Utah with his two young daughters and his girlfriend Alicia, when he came across a fellow Freemason blogger’s appeal seeking a living kidney donor for Chris, a 26-year-old fraternity brother. Chris had been battling juvenile diabetes for most of his life, and he was losing the fight. Relying upon dialysis treatments three times a week, Chris was in end-stage renal failure. Freemasonry unites men of good character who share a belief in the fatherhood of God and the brotherhood of mankind. Richard has always strived to abide by Freemasonry’s principles of brotherly love, relief and truth. Caring for others and aiding those in distress was Richard’s way of life. Despite the fact that Chris lived across the country in Washington, D.C., and that Richard had never laid eyes on him, he felt compelled to help the young man who had so much more living to do. Four months later, after being worked up and deemed a match, Richard flew to D.C. to donate one of his kidneys to Chris. The surgery was a success, and both men were soon back on their feet. Chris’s good health meant that he could continuing working and attending graduate school to pursue his dreams. Richard returned to his life in Utah with one less kidney, but with a new friend for life whom he thinks of as family.